Kravsow's final article in his series discussing violent and sexual comic books. He notes warnings from various public officials for publishers to police their content. Several educators and civic leaders voice their concerns regarding the violent and sexual content in comic books. Kravsow discusses comic book publishers' response to the controversy. Many of these publishers insist that it is the responsibility of the parents to mediate their child's reading habits. Depravity For Children - 10 Cents a Copy! Discusses a reporter's investigation of comic books in local drugstores and why they are unsuitable for young readers. 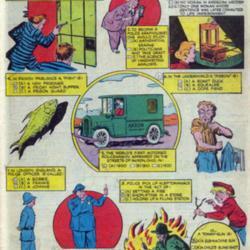 Kravsow describes some of stories distributed in crime and horror comics. 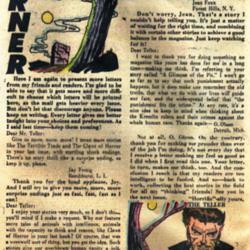 Discusses comic book artist Edward J. Moline. His work includes illustrations for both crime and horror comics. Examines the Citizens' Committee for Better Juvenile Literature and their investigation of crime and horror comics. 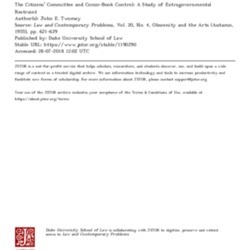 Twomey additionally provides an overview of the controversy. 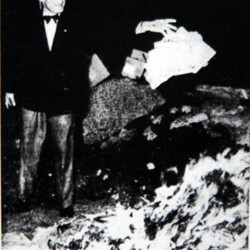 Image of Len Wynne standing over burning comics. The caption describes the Jaycee Youth Leadership committee, and their role in collecting and burning 8000 comics in Vancouver. 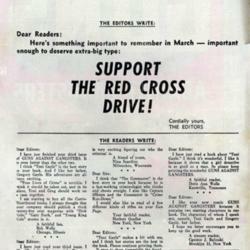 Letters from readers with responses from the editor. Letters from readers to the editor praising the stories in Guns Against Gangsters. A quiz testing readers' knowledge of crime detection terminology.